Destruction Of Timbuktu's Treasures Continues : The Two-Way Islamist extremists have been knocking down centuries-old tombs and other sites sacred to Sufis. Little can be done to stop them. 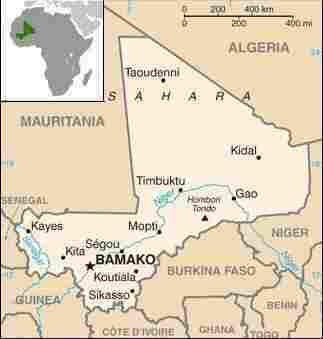 There's no effective government in Mali. The democratically elected president was toppled in a coup earlier this year. 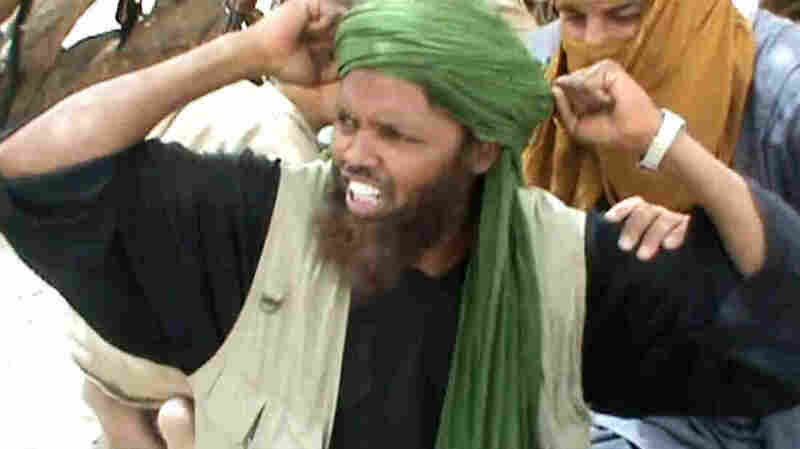 In this image from a video, an Islamist militant celebrates after the destruction of a Sufi shrine earlier this month in Timbuktu. Morning Edition today catches up on the news from Mali, where as we reported last week Islamist extremists are destroying centuries-old historical sites in Timbuktu because they find them offensive. Human Rights Watch senior researcher Corinne Dufka, who is in Mali, tells show host Renee Montagne that the destruction of tombs and other sites sacred to Sufis continues. And because there is no legitimate government in the country now, there's seemingly little that can be done, Dufka says. About all other African nations are trying to do is "contain and stop foreign Islamists from coming into Mali," she says. Mali's democratically elected president was toppled in a coup earlier this year. Rebel groups have since moved to grab parts of the nation. Meanwhile, a "serious humanitarian crisis" is growing, Dufka warns. About 300,000 people have fled to neighboring countries to avoid the fighting between various forces. There's a "looming famine," Dufka says. Extremists from a group known as Ansar Dine, as NPR's Ofeibea Quist-Arcton said last week on Talk of the Nation, say the tombs in Timbuktu, "these mausoleums of Muslim saints, are idolatrous." That, of course, is the same excuse the Taliban gave about destroying the towering Buddhas in Bamiyan, Afghanistan, in early 2001. Update at 9:40 a.m. ET. France Talks About Military Intervention. "The French foreign minister is raising the idea of foreign military intervention in Mali to drive Islamists out of key territory, the size of France, that they have seized in the desert north." But, she adds, "the minister's spokesman, Bernard Valero, says 'it will be the African countries who would have to be on the front line. We do not have any intention to directly intervene.' "